Eliminate the risk of cross contamination. Health care professionals understand the risk posed by the life-threatening infectious diseases found in today's medical environments -- the risk to themselves and the risk to the patients they treat. They must be able to feel secure that their instruments and equipment are free of infectious diseases. 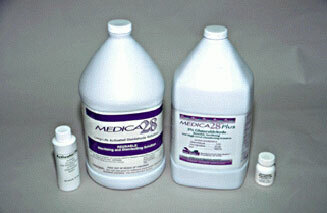 Medica 28 and Medica 28 Plus provide that security. Medica 28 and Medica 28 Plus are classified for disinfection and sterilization in the critical and semi-critical categories, Delivering one-step protection in the following areas: Tuberculocidal, Sporicidal, Virucidal, Pseudomonacidal, Bactericidal, and Fungicidal. Express Medical, P.O. Box 68, Sturgis, SD 57785. Tel: 800-996-2996; Fax: 336-292-1322.